It’s best she learn now. Original script for Panel 3 had Andi gesturing towards Amanda with a "See? This is what I'm talking about" expression, but upon actually drawing it I was afraid it gave the impression of Amanda being "tricked" into a flip-out, which was not a desirable message, so I modified it to a facepalm. Oh yeah, I know “THOSE kids” too. Hopefully during this meeting Amanda will finally get a taste of how family is supposed to be supportive and patient, and in return she learns from Todd, Mari, and Theo that you don’t get away with treating people badly. Seems to me like Andi is being patient and supportive (and has been in the strips we’ve seen, as well as also not being too proud to show Amanda that adults can also be scared and nervous about things and didn’t try to hide behind “I’m the parent that’s why” even if it would have been easier), but more family is better for such an attention-starved child. I wouldn’t exactly call Selkie mean here. She is being overtly honest, which along with asking awkward questions is a common child trait. While she may need to learn tact and social tactics, that tends to come with time, experience and maturity. I do hope that they deal with this without pushing against her right to feel a certain way. Our society, and various smaller potions of our culture, tend to make normal human reactions (emotions, mostly) that aren’t hurting anyone into horrible things that you must never, never do. Even worse, it’s somewhat gender-based (girls can’t get angry, boys can’t cry), and mixed up with actions without regard for willpower (anger can cause you to do bad things that do hurt people, therefore you must never feel anger). It’s important to give people the freedom… no. People HAVE the freedom to feel whatever they feel, and should have the freedom to express these feelings (in a non-manipulative way, like, not using “I feel sad” to mean “you should feel guilty and do things for me to make me less sad”), and people should support their right to have these feelings. It’s kind of related to the issue of weird politeness rules: If you don’t like the taste of something, you should be free to either stay silent about it or to state the fact, just not in a rude way. You shouldn’t be forced to say you like a food that you don’t like, or that you liked a gift that you don’t like. People’s feelings shouldn’t depend on you covering up your own feelings. *You should be free to state it in a rude way. You should be taught other ways of stating it that aren’t so rude… and certain times when it’s better to be silent unless someone points it out. Generally, you should choose the ways that aren’t rude, unless there’s some good reason to be rude. It sounds okay to be silent, but it’s not. I was taught “If you can’t say something nice, don’t say anything at all.” Meaning rather than teaching me how to say things the right way, I was taught to stay silent if I didn’t do things the civilized way. I can’t express my emotions now. At least grandma won’t fall for the “puppy-eyes” trick since her father might have tried it before her and thus built up her resistance. Exactly my train of thought… I knew WAY too many kids growing up (mainly girls) who thought all they had to do was bat their pretty little eyelashes or conjure up some crocodile tears to gain sympathy from parents, teachers, or any other authoritative figured adult. So I ain’t falling for any of Amanda’s BS here. Of the three Smith siblings, I bet Antoine does the best puppy-dog eyes. and Marta gives the best Noogies! Ahahaha i love it!! 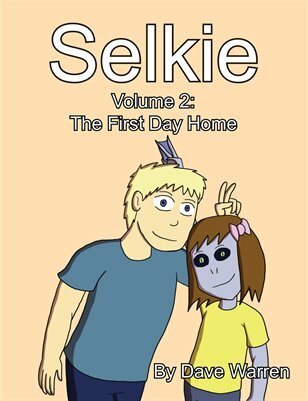 the dialogue between amanda & selkie is too hilarious.. my younger brother & sister were born around 1 year apart. They were -definitely- ‘those’ kids! It’s like going back in a time machine ? I’ve been reading selkie for a very long time and although Amanda has a sad back story I think she’s really not likeable. She seems to take things for granted and feel superior to everyone. It would be an interesting twist if Todd was not her real father but Andi’s daughter with another guy. A good part of why Amanda is the way she is, is because of her back story. There is also such a thing as putting up a front, pretending traits you don’t have because you hate who and what you really are, or are trying to not look weak so you don’t get taken advantage of or worse. The second is very common in children who have been institutionalized, which is why imprisoning children for criminal offenses usually has the opposite effect of what is desired. We have a bunch of orphanage kids (Selkie herself amongs them!) who aren’t awful shits for comparison though. I’d argue Selkie had a much harder time than Amanda yet she turned out much better. Selkie has become less likable to me over time. Selkie came from a loving family, though. Amanda came from an abusive one. I’m not saying that excuses Amanda’s behavior, but it does explain it a little; especially considering that a lot of it is probably escalation because she’s so defensive. There’s also the fact that everyone reacts to things differently. Another child in Amanda’s position might be a lot meeker to avoid attracting attention to herself. Another might develop a sense of humor to try and prove he’s worth more safe and healthy than abused. I don’t like comparing people to each other because of that. Don’t think it has anything to do with the upbringing. Some kids just play lightning rod in their families and the larger, more dysfunctional the family the more theatrical their lightning rod display becomes. It’s hard to find a “fam” larger or more dysfunctional than an orphanage; Amanda and Selkie are already sisters just from their time together there. They’ve got the sibling rivalry thing down pat because they’ve been playing it all through their time there. Amanda reminds me of my second to youngest brother, he was always getting himself into hot water because bad attention was better than no attention. Parents (esp my mother) subliminally encouraged it because his shenanigans kept them too busy to look at their own relationship problems. Looks a lot like what Amanda’s doing here given how thick the tension between the adults is. I was raised in the same fam he was but my role was different because my personality was different. Introverts as a general rule don’t make good lightning rods, all that time in their own company means they think too much. Which is a more likely reason why Selkie isn’t one whereas Amanda is. 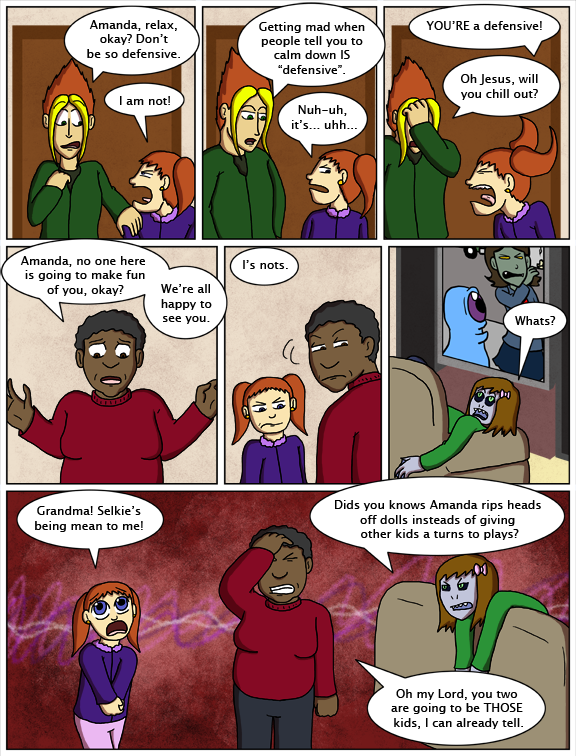 Since Mari recognizes Todd’s features in Amanda’s face (and so do the readers), another guy is highly unlikely. I’m not a big Andi fan, but there’s never been the slightest insinuation she might have been messing around on the side. A few people have stated she looks more like Agent Brown than Todd. Careful there Selkie, grandma Mari isn’t afraid to give you a stern talking to. Or an even sterner horse poop shovelling. @ Mari: Yes. Yes they are. Children! Model the small emotion-eating eyestalk on the screen! He is kind and good and concerned for the happiness of those around them! This is progress! They’re acting like siblings! I hope Grandma’s blood pressure medication is up to date.. I don’t blame Selkie in the slightest. I also don’t see Amanda as likeable, but I don’t see her as entitled or feeling superior. I feel like she feels like the world has been shitting on her pretty much since day one and she’s taking it out on everyone else. I mean, it’s not like you can punch Life in the face. She has no right to, but I don’t doubt she feels backed into a corner almost constantly. Hence her constant lashing out and being “defensive” all the time. Luckily Grandma was/is also a foster parent. She should have multiple levels of kid XP. Okay, Theo, everyone is counting on you now! Go ahead and save this situation! I believe in you! Grandma’s proportions are weird in the last panel…she looks like a dwarf. So they’re basically Daria and Quinn? My two younger brothers are. Exactly. Like. This. Ugh, you’d best prepare yourself Grandma. Funny thing, I can totally believe Selkie’s accusation is true and not made up in the least. I don’t think it’s made up. I totally see Amanda doing that. Selkie hasn’t lied to her grandparents yet. What do you do with such a child? It is a common behavior, to want to dominate others. It has been my experience that people (including kids) won’t change unless they want to. To get them to the point they want to, you need to start pointing out the negative consequences of their problem behavior so they become aware of what they’re doing. A lot of people run on “bad” subconscious programming and don’t even realize that it’s wrong. If that’s the case, simply making them consistantly aware of how they’re making their own problems and pointing out the consequences of their actions may help, assuming they’re ready to move up to a better level of social interaction. In the case of children in particular, you’re going to have to get the parents support and help as well because odds are they’re reinforcing the behavior – kids won’t continously act out that way unless parents allow the child to get something out of it, be it negative attention or their own way at the expense of other family members. Chances the child will change are tied directly to whether or not the adults in their fam are willing to recognize how they’re enabling the problem and stop playing that game. Which isn’t likely to happen because if the parents were self-aware enough to accept responsibility they wouldn’t be in that boat to start with. They’re also likely to have a lot of reinforcement from other friends, fam, and acquaintances about how rotten the kid is and how it’s not their fault because said contacts have no clue about what’s really happening behind the scenes or are so used to playing those kind of games themselves with their own kids that they think it’s normal. Note: In conjunction with pointing out the negative consequences, it helps to roleplay more positive ways to handle the situation in the future. You sort of mentioned, but didn’t really address, another part, though. Talking through the negative consequences of the behavior is good, modeling good behavior is good. It never even occurred to me that it might be false. My older brother would do similar stuff. Getting mad when someone tells you to calm down is a valid response to feeling like your emotions and your opinions don’t matter. “Calm down” is not helpful at all; it’s telling a child that their feelings are invalid and unimportant. A lot of the time, children’s feelings ARE valid and unimportant.